Talented art students are showing their work at the Annual Dare County Schools Art Show, April 1 to May 1. The show runs Monday through Friday from 9 a.m. to 5 p.m. in the Event Room at Roanoke Island Festival Park. 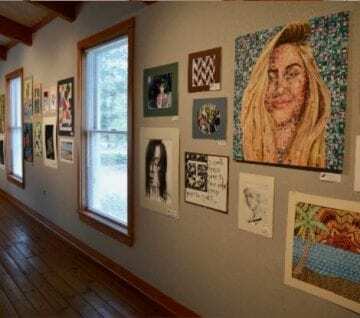 The public is invited to tour the free exhibition and enjoy the creations of local students from First Flight High School, Manteo High School and Cape Hatteras Secondary School. In addition, First Flight and Manteo Middle Schools will be joining the show for the first time. “The Art Show is an event we look forward to every year. The talent and creativity of our local students is truly amazing and shows the dedication of our Dare County art teachers,” said Kim Sawyer, executive director at Roanoke Island Festival Park. The show will feature an impressive variety of artistic mediums, including mixed media, paintings, graphic design, drawings, photography and sculptures. This annual event not only gives students a platform where they canshowcase what they have learned throughout the year, but also provides them an opportunity to try new techniques.